Though the weather outside lately has more resembled fall, if not winter, than summer I have taken to creating my summer reading list. I know I’m a bit behind on the times, but last month was just terrible overall, even if I did manage to read five books, so I had not gotten around to making my reading list. For the most part my list will be flexible. I do not plan to read them in the order they are listed, with the exception of the first few. Why? Well the answer is simple, while wandering around Goodreads I came across some requests for a few authors who were looking for people to read and review their new, and in some cases older, novels. Well I jumped at the chance, volunteering to do just that. This will certainly help me in my goal to explore the genres I normally wouldn’t read and introduce myself to new authors as well. 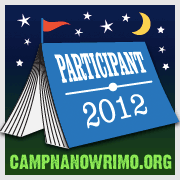 Another thing to keep me busy this summer is Camp NaNoWriMo. This is very similar to the November NaNoWriMo, writing fifty thousand words in thirty days, except that with the warm summer weather you might be tempted to go spend time outside instead of at your computer writing. That’s alright, might as well enjoy those summer days while they last. I haven’t decided completely if I will be participating in both Camp NaNoWriMo’s this year, one in June and one in August, but I am definitely doing the June one. Which actually starts tomorrow. Wait. What am I panicking for? I have my novel planned out. A nice outline, timeline, character sheets, map, you name it if I need it for my novel it’s ready to go. Now I can breath a sigh of relief. No more pantsing for me, I learned my lesson after the 2010 NaNoWriMo that I am most definitely not a pantser. I am a planner 110%. The only hitch in my plans, my parents arrive today for a week long visit. Though their visit will completely disrupt my first week of writing, since I know they will neither understand what the big deal is nor allow me to sit at my computer to get some serious writing done, I am confident that I will come out a winner. With my outline firmly in place I should be able to make up those lost words in a matter of days and be well on my way to the fifty thousand mark.